potential is your comfort zone. Great things happen when you make friends with your discomfort zone. * Don’t be afraid to make mistakes. Wisdom helps us avoid making mistakes and comes from making a million of them. * Don’t indulge in self-limiting thinking. Think empowering, expansive thoughts. birthright so don’t settle for anything else. * Spend at least one hour a day in self-development. Read good books or listen to inspiring tapes. Driving to and from work provides an excellent opportunity to listen to self-improvement tapes. try to accomplish a task. Finish one task before you begin another. aren’t able to make things happen in the present. * Dare to dream big dreams. If there is anything to the law of expectation then we are moving in the direction of our dreams, goals and expectations. miss, so don’t miss a thing. 1. Develop an interest in people and become other oriented. 2. Know what people need and then try to meet those needs. 3. Ask about their family and be genuinely interested in their answer. 4. Find people doing something right and praise them generously. 5. Believe in the collective wisdom of the group. 6. Talk in terms of a person’s main interest….THEMSELVES. 7. Always look directly at the person you are speaking to. 8. Laugh at yourself. When you do you give people permission to laugh at themselves. 9. Start believing that people are your most valuable resource. 10.Always give credit, don’t take credit. 11.Care about the health and well being of people. 12. When you must correct another person always do so gently and in private. 13. Always give another person the benefit of the doubt. 14. Never treat people like numbers or things. 15. Learn and use their first names. 16. Never give the impression that you are too busy or rushed to care. 17. Never use sarcasm in conversation. It’s a low form of humor and can be hurtful. 18. Never try to make yourself look good by making someone else look bad. 19. Share cute, funny, clean stories with those you work with and invite them to do likewise. 20. Laugh and play together as a group. There is a bonding power in laughter and play. 22. Smile. There is power in a smile and life is just too short not to. 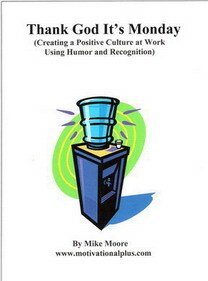 Mike Moore speaks and writes on Humor and Human Relationships. 1. Humour in the workplace reduces stress levels and stress is the number one problem confronting employees today. 2. Laughter,positive attitude and recognition boost morale while stress erodes staff morale and alienation. It is in the best interest of any business to invest in the happiness of its employees. Laughter is an effective barometer of just how happy your people are. When positive attitude and recognition are added to the mix great things happen that impact positively on both health and safety. When employees feel appreciated, they tend to have a more confident and positive attitude and are more focused when doing tasks that involve caution and attention. 3. Keeping things in perspective tends to boost morale and humor helps us keep things in perspective. 4. Workplace humour helps facilitate change. Change is inevitable and people who laugh well and often tend to be more flexible and adaptable. 5. Communication improves when humour is used appropriately. The timely use of humour can get a point across effectively and assists in the process of problem solving. 6. Laughter and humour in the workplace relieve boredom and increase creative energy. 7. Humour builds confidence. When we laugh at ourselves we are less rigid and more spontaneous. We tend to bounce back more quickly when negative things happen. Humour also makes us less fearful of making mistakes and more confident about overcoming setbacks. 8. Laughter and humour promote positive relationships. When you hear a funny story your first impulse is to tell someone and share the laughter. When laughter is shared a natural bonding takes place. So humour and laughter tend to promote a sense of team and co-operation. 9. Humour promotes happiness and joy. It’s good to be alive. 10. Quality relationships are measured by the amount of laughter present. When relationships are good, people laugh a lot. The same applies to businesses. When employees enjoy one another and laugh easily and often, we see performance improve and profits increase. 11. The humour I speak of here must never be based on laughing at someone, racism, sexism, put downs, sarcasm or ridicule. These forms of humour are destructive attempts at making one look good by making another look and feel badly. There is enough good humour to last a lifetime. Just look for it. When I refer to the positive role humour has on health and safety it is important to point out that I do not mean that humour and laughter should be present when people are doing dangerous tasks. That would be irresponsible and distracting. I believe that humour bonds people to one another thus promoting a sense of focussed attention, team co-operation, and caring for the health and safety of those with whom they work ESPECIALLY on hazardous tasks. 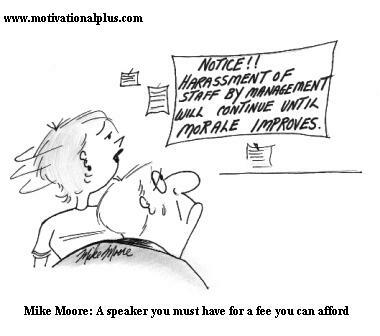 These 18 FREE workplace cartoons by Canadian Speaker/Humourist Mike Moore are designed to help manage people more effectively using humor and recognition. Great for staff memos, bulletin boards, newsletters, inservice, and staff-room fridge doors. 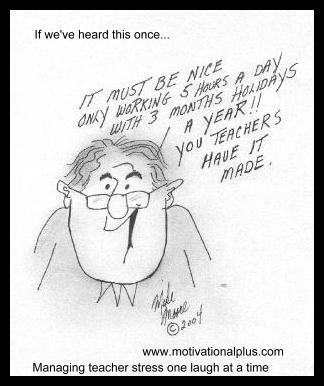 I recall teaching with a young woman who was going through hell and was forced to take an extended stress leave because of one toxic parent and one unethical fellow staff member. Her teaching style was low key. She was a bit shy and lacked confidence when talking to parents and peers. After 6 months on stress leave she returned to teach at another school under a stronger, more understanding and supportive principal. She never had a problem like that again and is now approaching 20 years in the profession. The sad fact is that I have seen this type of story played out far too often with more tragic results. It is one of the reasons I have committed myself to becoming an advocate for teachers to help promote fair treatment, self confidence, assertiveness, joy and a healthy productive relationship between teacher and parent. How to say NO! and mean it.